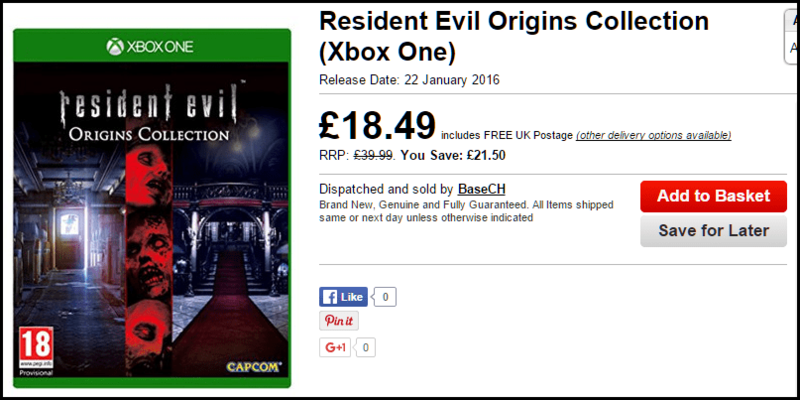 Resident Evil Origin Collection includes both Resident Evil HD and Resident Evil 0 HD. Resident Evil HD, as the name suggests, is a remastered HD version of the original Resident Evil game. Resident Evil 0 was originally released back in 2002 on the Nintendo GameCube and is a prequel to Resident Evil. Resident Evil Origins Collection contains both the critically acclaimed, previously released Resident Evil HD and the upcoming Resident Evil 0. In the original Resident Evil, players choose to take on the role of either S.T.A.R.S. team member Chris Redfield or Jill Valentine, who have been sent into the city to find the missing Bravo team. With limited ammo and survival items available, gamers need to keep their wits about them to survive the various trapstraps and puzzles that greet them at every stage. Resident Evil 0 takes players back to 1998. Reports have been mounting about unusual murders on the outskirts of Raccoon City. The city’s Special Forces D=division, S.T.A.R.S. send their Bravo Team to investigate, including rookie cop member Rebecca Chambers, who meets death row convict and ex-Navy lieutenant Billy Coen.